When a factory closes, the surrounding area takes an economic hit, and sometimes a spiritual one too. A plant can be a town's center of gravity, its very source of identity, especially when that company gives that town its name. 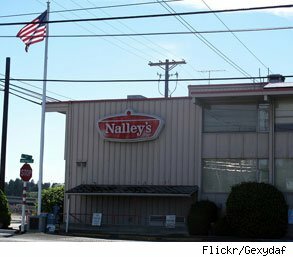 Nalley Valley, Wash., is named for the Nalley's Fine Foods factory that for over 50 years ticked local noses with a briny waft of pickles. Over the years, Nalley's has slowly downsized, from 700 to 160 workers, and from pickles, chips and peanut butter to wholesale mayo and canned chilli. In July, Nalley's finally left Nalley Valley altogether, consolidating with its plant in Fort Madison, Iowa. And so, with some Teamster negotiations and a few tears, that stretch of southern Tacoma bid farewell to its namesake. Nalley Valley was no longer Nalley's. Many American towns are named for the factories or industries that turned them into thriving communities. Sugar City, Idaho, was founded in 1903 to house the residents of the nearby sugar beet processing plant. The factory closed decades ago and now Sugar City is just a quaint name. The Frank Pure Food Company not only gave its hometown its name, it also made it famous. The bulk sauerkraut producer turned the hamlet of Franksville into the kraut capital of the world. But when Frank Pure Food left town over 15 years ago, it killed jobs, as well as the annual Kraut Festival, and its crowning event, the World Championship Kraut Eating Contest, was replaced by a Casino Night that was more hip with the kids. Sometimes an old factory name is a jumping off point for reinvention. The phrase "concrete plant" doesn't usually evoke images of tree-lined promenades, but Concrete Plant Park has become a waterfront oasis in the industrial sprawl of New York's South Bronx, the poorest congressional district in the country. The plant closed in 1987, but it took more than 20 years for public agencies and community organizations to convert the site into a grassy shoreline. Now the still-standing silos, hoppers and conveyors are public art. The name Concrete Plant Park is both a nod to the area's polluted, industrial past, and a reminder of the possibility of reinvention. Hopefully Nalley Valley can do the same.